Everything started in 1919 with the millennia-old craft of sand casting. 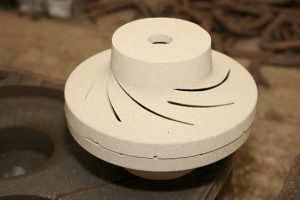 With this method, a model is composed in sand and later removed. The resulting hollow space is filled with cast and solidifies in the desired form. This may sound simple in theory, yet the different physical characteristics of metals in the solid and liquid aggregate state make it a highly complex process. Here especially, our know-how and experience, passed along from generation to generation over decades, becomes a critical factor in determining quality. 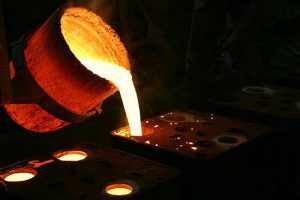 The sand casting foundry is specially equipped for the manufacture of custom alloys required primarily by our customers in the mining and steel producing industries, glass mould manufacturing, the pump industry and the electro industry. We are capable of producing highly complex components with individual weights of 2000 kg. We base our current production on models, moulds or drawings and cooperate with a professional model builder.